As we continue organizing weekly cooking sessions, my friends wanted all my recipes and I wanted theirs too. It was such a hassle to type and print the recipes that they suggested me to start a food blog. Weirdly, the blog was launched exactly on the day of my birthday. I have to admit that I was clueless on how many food blogs were out there until I found out about Foodbuzz and became a member on May 2009. I actually thought I was one of the few in the world that enjoy sharing tested recipes. Random Recipes was launched and every time a yummy dish is made, I type down the recipe along with crystal clear step-by-step pictures. I think that's the best way to teach people how to cook, making sure all the steps are carefully realized. For the skeptics, the word Random is related with my field of research in quantum physics (nanotechnology) where, at a scale 10,000 times smaller than the size of a hair (i.e. nanometer size), physical phenomena at this scale are explained in terms of uncertainty and probability, basically random events occur. So, we are always uncertain of the dishes we will be making at the subsequent cooking sessions. 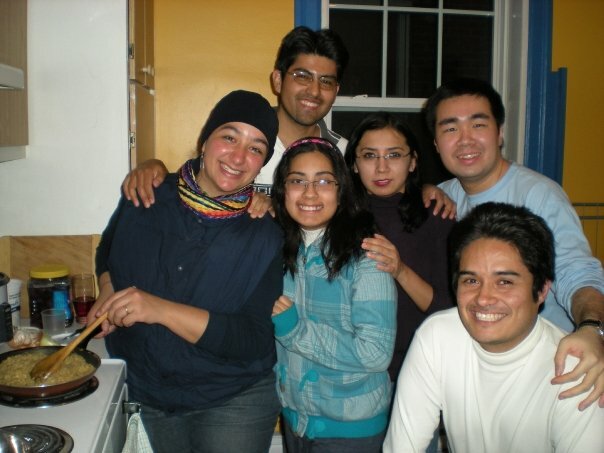 In April 2009, four months from the launch of my new blog, Fernando and Jorge felt comfortable in their cooking skills in which they made their first ever national dish Alambre and Creole Beef Soup, respectively. At this point, I don't need to go to all this trouble to think of 3 dishes. I can focus on making 1-2 dishes for the subsequent cooking events and I was still in charge on making desserts. It was also this time that we invited new people to the group which included exchange students and newly arrived graduate student. Because of my blog and my food pictures posted on Facebook, many of my non-physics friends are interested in joining my cooking sessions. At that moment, I wasn't too sure how to manage that much people to fit in a small apartment. Even worse, I was worried if there was enough food for everyone. The best solution was to create new cooking groups and organized it once every 2-3 weeks, depending on the group circumstances. Some groups are more active than others. Up until now, 70 people has joined to at least one cooking session and 6 cooking groups were formed. After 2 years of organized cooking sessions, the group is still expanding. The original members are still in the group and me, behind the camera. To make the cooking even more entertaining, I sometimes think of cooking themes that the group has to follow. Every session must have a soup, 2-3 appetizers, 1-2 main dishes and 1-2 desserts. When I initiate the event, my friends have to decide which meal course they want to take on and it is on a first come first serve basis. Once I received everyone's responses, I will have to fill in the gaps. I'm pretty much versatile at cooking any meal course and love cooking challenges. As we continue organizing cooking sessions, I was less and less the person in charge of desserts and develop a high interest in making delicious savory and homey dishes. Don't worry my baking skills are not lost. 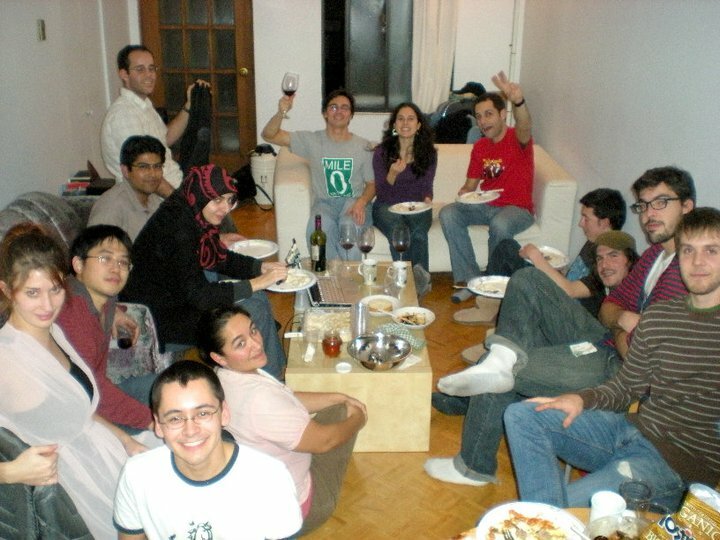 I have to admit that the biggest challenge in 2009 was to integrate vegetarians to the groups, that was sort of problematic. The vegetarians tend to eat before the cooking session and only come for desserts. It probably took me a year to solve this problem and I can't believe that I have not thought of that. The solution is simple, add vegetarian options to the menu. Duh! For the past few months, we adapted this menu which should go something like this for a party of 12 people: soup, 2-3 appetizers (one must be vegetarian), salad, 2-3 mains (one vegetarian), 1-2 desserts. This is how you make everyone happy! Many friends and family wanted to access my blog, but tend to forget the website. I have to admit that my blog was lacking of visibility and it was difficult to find it on any search engines. I was surprised that there is even a band right here in Montreal called Random Recipe. I knew that I have to come up with a new name. I realized that my friends come from different part of the world and like to make their favorite regional dishes. On June 2009, I changed the name of my blog to Random Cuisine. 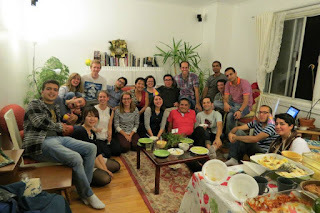 Since then until now, we never stop organizing cooking sessions and we always bring new people to the group. I guess that my most enjoyable moment is to see my friends evolve as an individual and acquire self-confidence as the time goes. I'm always amazed how these cooking sessions can transform a person who never cook before into a confident cook. We never forced the person to do it, it just comes naturally. While food blogging, I never expected to become part of the Montreal food blogging community and met some wonderful local food bloggers, just to talk about food. I also received numerous invitations to participate at foodie events. I'm so glad that I'm in Montreal. Blogging and organizing cooking sessions for over three years had made me a better person. Before that, I was the reserved type of person who doesn't speak much to people even though I see them all day. Now, I feel that I acquire enough confidence in initiating small talks even with people that I don't know (like in an elevator). I also learn to take initiative and prove myself that I'm a versatile person. I guess these skills have translated it into my career as a researcher, making progress in science and keep in close contact with my collaborators. Decide who is willing to host his/her place on cooking day. Ask your host to send you a brief list of available kitchen tools and the number of people who can fit in his/her apartment. Decide a cooking theme (e.g. seafood, red and white, ‘B’-theme, appetizers, etc…). Start sending invitations one week in advance with time, date, host’s address and available kitchen tools. Be selective, you don’t want to invite like 50 people in one place. Ask your guests to decide which meal course they want to cook. For 12 guests, a typical meal course is: soup, 2-3 appetizers (1 must be vegetarian), salad, 2-3 main dishes (1 vegetarian), and 1-2 desserts. Make sure that it is not the same person doing the same meal course every time. The day before the group cooking, e-mail your guests the menu and fill in the gaps if you fell there is not enough food. On cooking day, make sure that the soup and appetizers are served first while the mains and sides are being prepared. Afterwards, serve the mains, sides and finally, the desserts. We usually end up with lots of leftovers, bring some tupperwares otherwise the host will have a fridge full of leftovers.